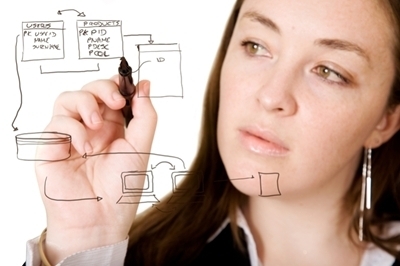 The first step in a custom database development project should be the creation of an effective software design. This specification should include a database design, a user interface design, a business rules processing design, test plans, implementation and training plan, and the necessary hardware acquisition/deployment plans to make the project a success. The database designer should build a conceptual database design and use a data modeling tool to insure that the relational database design and indexing structures are correct. Use of additional performance tools such as database normalization, stored procedures and triggers also need to be carefully planned during the database design phase. Other considerations also need to be included in the design, such as SSL (secure socket layer) for web database development and appropriate user and encryption security for all custom database software. We have extensive business process knowledge and can help you improve operational performance and increase customer satisfaction and loyalty. Don’t wait for your competitors to give your customers what they want. Let us review your existing website and internal systems and create a database development plan to improve your business. 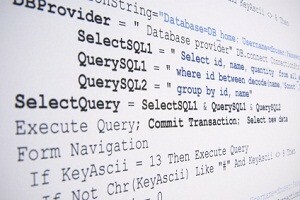 ISG provides database development services for SQL Server, MySQL, Oracle, and Access databases. We use the latest development technologies including C#, ASP.NET, and VB.NET to insure that your custom application will function properly. Our experienced database developers can work directly with your in-house staff or, if the situation dictates, develop the entire project from design through training and implementation. ISG also provides a range of database services and development of custom business database software and eCommerce database software. Do you have an existing database driven software product that isn’t integrated with your business software applications? Or maybe you have existing data in SQL Server, MySQL, Oracle, Access, DB2, or other database that doesn’t allow for sharing of information? ISG’s database application development team can help you design, develop, and install custom database software tools that will provide access to all of your business data. We can also convert your existing legacy files to a database format or develop custom database connections to access their data. Static web pages were OK when the Internet was in it’s infancy but in today’s The job of database programming goes beyond simply hooking up new program code to the database. To be truly effective, a successful database solution must be developed using a carefully thought out combination of efficient program code and database utilization techniques. Working with the DBA, the database programmer can assist with development decisions such as creating indexes and stored procedures for performance improvement, adding foreign keys to improve the referential integrity of the database, and selection of display methodologies that improve software performance and presentation of data. ISG also provides data warehouse design and development services to help you off load reporting services from busy database transaction servers. Please Contact us for a free, no obligation telephone consultation to discuss your database development, custom database application, and database integration needs. We have extensive experience developing interfaces between platforms / languages and a wide variety of database software applications. Our database services staff can help you design a high performance, normalized database, interface the data with existing applications, and develop new custom database software applications to power your business. ISG database consultants and database designers can also help you resolve issues with your existing database applications and, when necessary, we support orphaned database software. Our database development methodology page contains more information about the database application development process.